However, an inflow of speculative hot money – which has buttressed a rally in Korean stocks – threatens to undo the recovery. “With an anticipated increase in risk appetite, foreign investors may invest further in emerging-market equities, leading to more dollar supply,” said one analyst. The first half 2009 current account surplus set a record, with forecasts for the second half not far behind. Korea’s foreign exchange reserves, meanwhile, have recovered, and could touch $300 Billion within the next year. Of course, the Central bank is not simply standing by idly. It has already lowered its benchmark rate to a record low 2%, and at yesterday’s monthly monetary policy meeting, it firmly refused to consider raising it for at least six months. Commented one analyst, “There is no urgent need to raise rates. 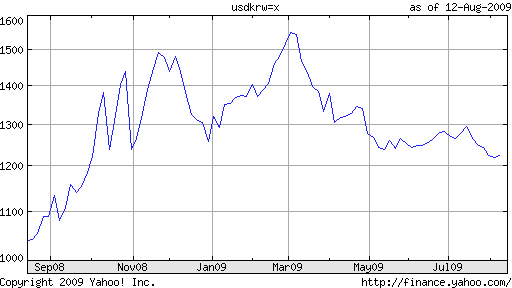 The most likely course of action is that the Bank of Korea will wait until the economy fully recovers, and in particular, they will wait until the unemployment rate stops increasing.” Still, given both that interest rates remain above levels in the west (see chart below) and that the Korean Won is considered undervalued, funds could continue to flow in. The Central Bank’s other tool is direct intervention in the forex markets, in order to depress the strengthening Won. But this, it is loathe to do: ” ‘It would be better to have a larger foreign exchange reserve in order to better deal with economic crises, but attempts to buy dollars to artificially boost the reserve volume could lead to accusations of currency manipulation, while excess won in the markets could stoke inflation,’ a high-ranking ministry official said.” Still, investors are growing increasingly nervous about this possibility:”A state-run bank that usually doesn’t participate much in the market bought some dollars at the day’s low, prompting speculation about a possible intervention, a local bank trader said.” Sure enough, after hitting the psychologically important level of 1,220 at the end of July, the Won dived. It has yet to bounce back.